Sit on the round side of the Bosu ball, hands behind your head, elbows out, feet on the floor, knees bent. Raise your shoulders up, exhale, inhale and get back in the initial position. Bosu ball is flat side up, grab the sides with both hands, jump out, pushing your legs out, so you’re in a push-up position. Jump your feet back in, stand up and jump up, arms above your head. Stand on top of the round side of a Bosu and squat. 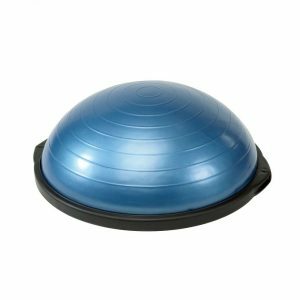 Sit on the round side of the Bosu ball, hands on the floor, behind your back, legs straight. Bring both knees to the chest, exhale, inhale, stretch legs out. Place one foot on the rounded top of Bosu, the other foot is flat on the floor, squat for 10 times, then switch legs and do 10 more reps. Sit on the round side of the Bosu ball, hands behind your head, legs straight in front of you. Bring your elbow to the opposite knee, alternate and repeat for 25 times. Sit on the round side of the Bosu ball, heels touch the ground, hold a medicine ball in front of you and twist your torso to the right, switch to the left, keep twisting right-left, while your spine is facing forwards. Stand on the flat side of the Bosu, holding a medicine ball close to your chest. Bend your knees into a squat position, then stand up and raise the medicine ball above your head. Place your right elbow on the rounded side of the Bosu, lie straight, while your feet are on the floor, one in front of the other. Lower your hips to 1-2 inches from the floor, come back to the start and repeat for 15 times. Switch sides. Place the Bosu rounded side down, hold the sides while you are in a high plank position. Run in place, bringing each knee out to your shoulders.